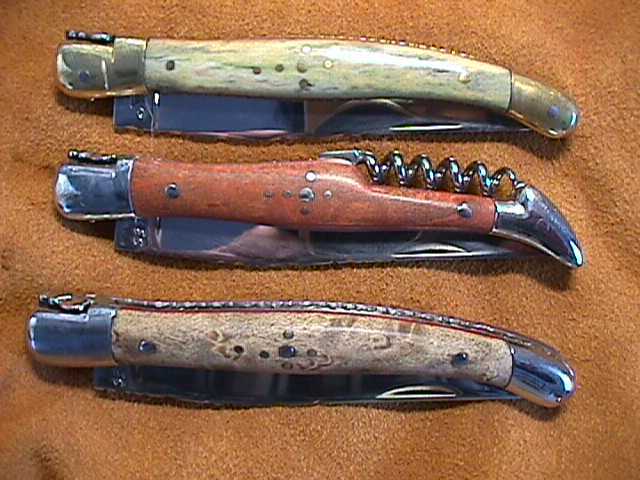 Hermit River Knives, folders, laguioles, trappers. 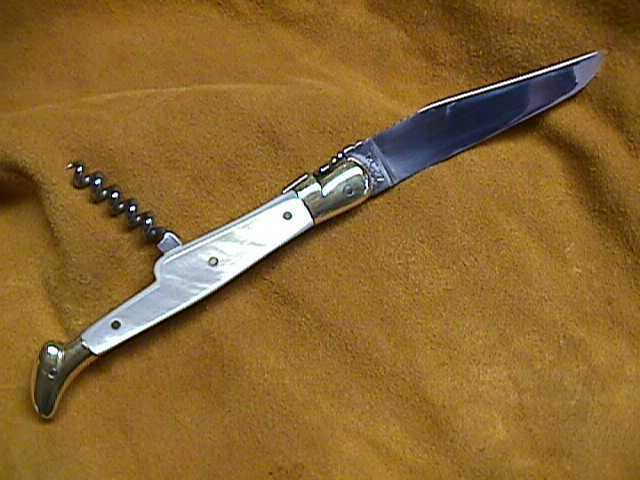 Welcome to my Folding knife page. I will be updating these pages shortly but this is a small sampling of some folders I have worked on in the past. 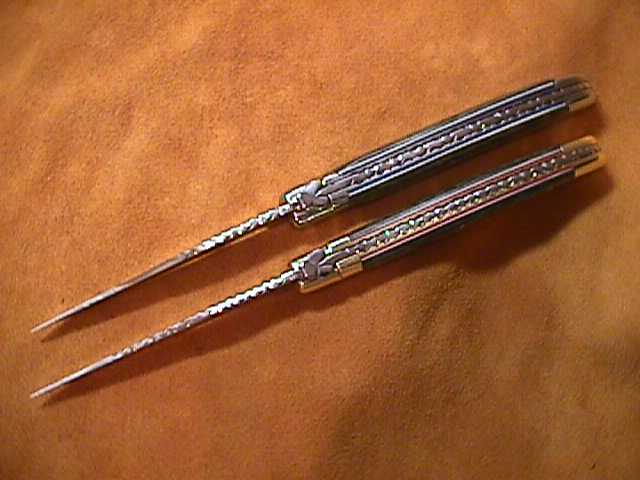 These laguioles (pronounced lay-ules) were made from Gilles parts which are the finest quality. 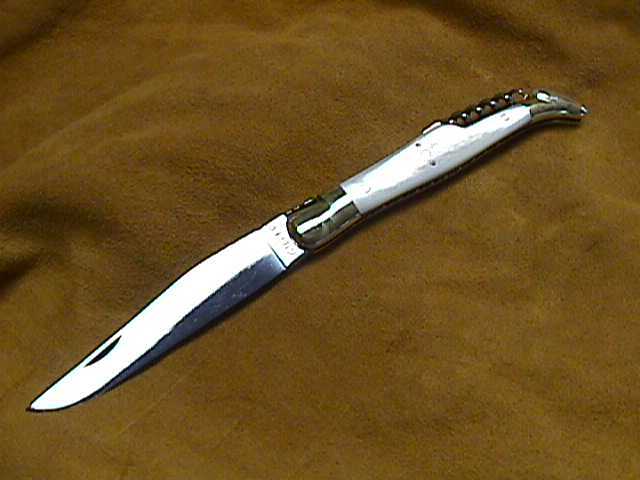 Laguiole was never trademarked and there are many manufactures, some good, some not as good. The first picture is a laguiole scaled in moose antler on top, pink ivory wood and a corkscrew in the middle and on bottom is birdseye maple. 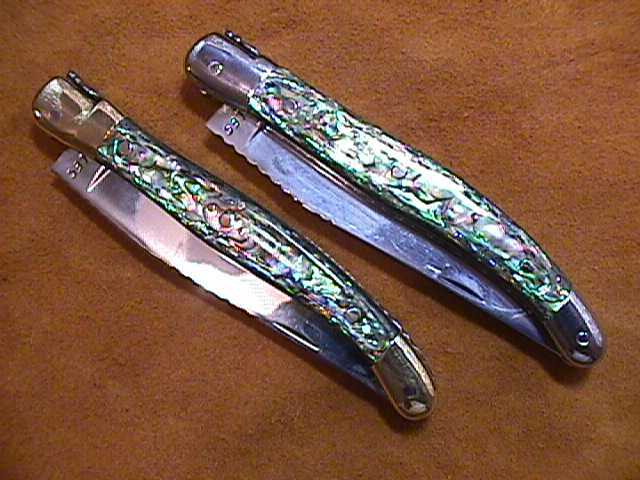 The second picture is of 2 customs made with paua. Paua is an abalone found only in New Zealand. Pictures do not do justice to the the beauty and depth of this material. You can see the extensive filework patterns on the top view of the blade, spine and liners in the 3rd picture. 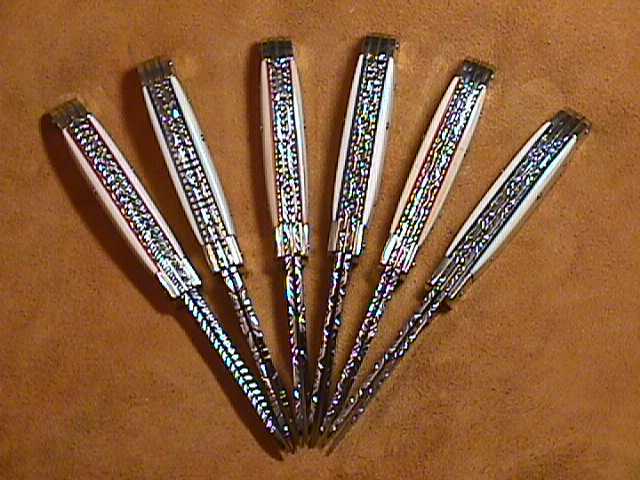 You can choose from many designs of filing. The bee nestled between the bolsters was Napoleans Royal Seal which he bestowed upon the city of Laguiole when he visited. The bees are handforged or filed in some cases. On the left side of the scale is the "shepards cross" done in rivets. 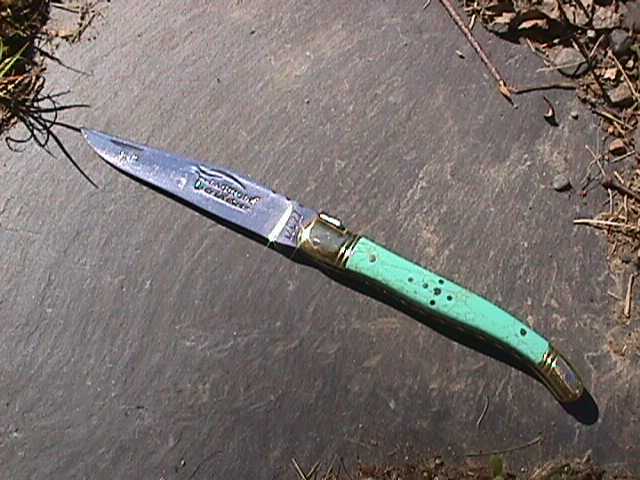 Sheep herders use to stick their laguiole in the ground at night, the sign of the cross was their protection. Nice to know if you are sleeping in grizzly country or herding sheep! 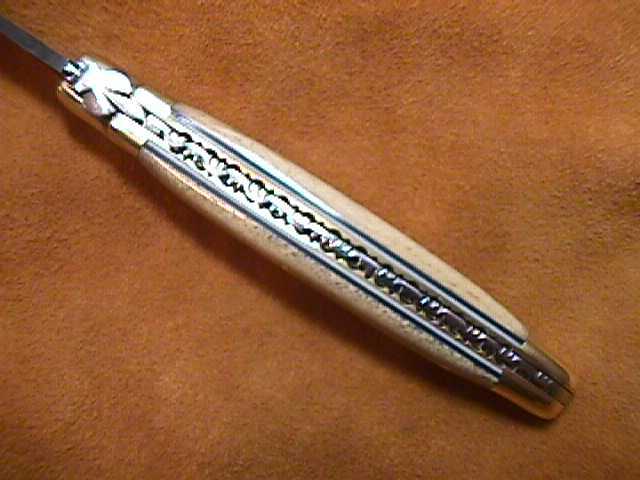 This is a top view of laguiole made from "oosic" which is the penile bone of a walrus and in this case is fossilized. The material has beautiful color and character. 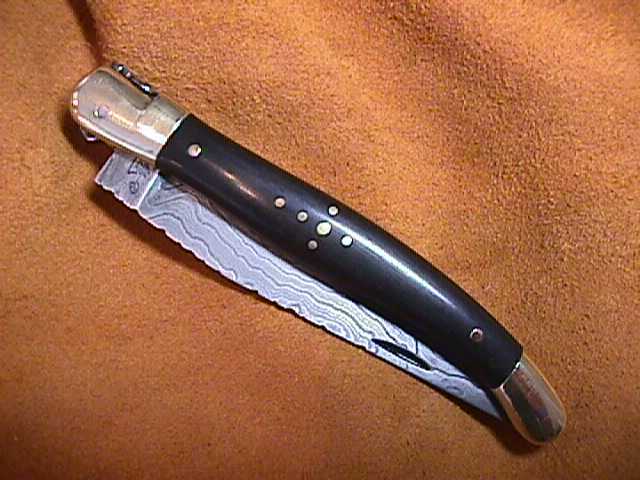 The knife is fileworked on the backspine and the liners. The spacers are blue between the oosic and the liners. I also did this on the Paua and do it on sea cow also. Why? They are all water creatures and blue/water seemed appropriate. This second view shows the backside of the damascus blade and Francois Morier's logo. The pattern is a raindrop design. 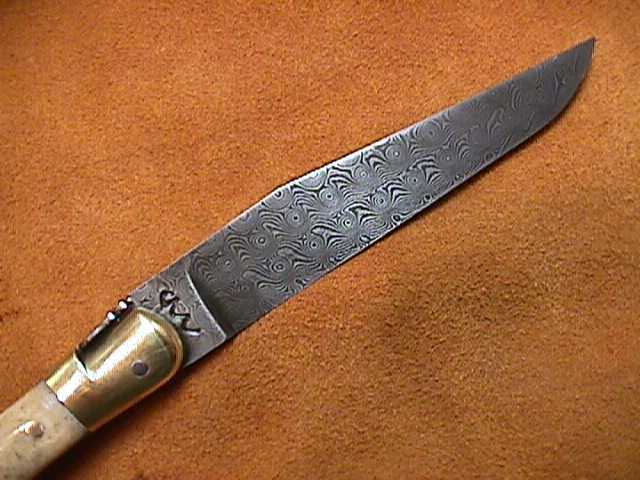 Damascus is properly called "pattern welded steel". Depending on the blacksmith, the techinque and the steels incorporated the patterns are endless. True "damascus" is actually "wootz steel" and is being remanufactured again by some blacksmiths on a mission. Different metals are melted in a crucible, certain impurities are necessary and a certain number of reheatings. Pattern welded is made by layering different steels, fluxing them and forge welding them together. For instance, 1095 steel and nickle makes for a high constast pattern. Damascus also takes a fine edge. The 3rd picture is of a damascus Morier blade with ebony scales. The "sheperds cross" is very visible on this one. 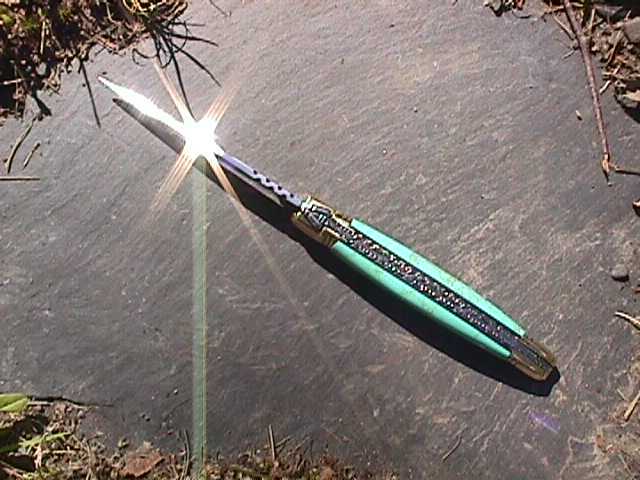 The scales composite turquoise which is 86% turquoise and a binder. Very striking material and easier to work than stone. It is file worked throughout. You can see the hand filed bee and the cross. 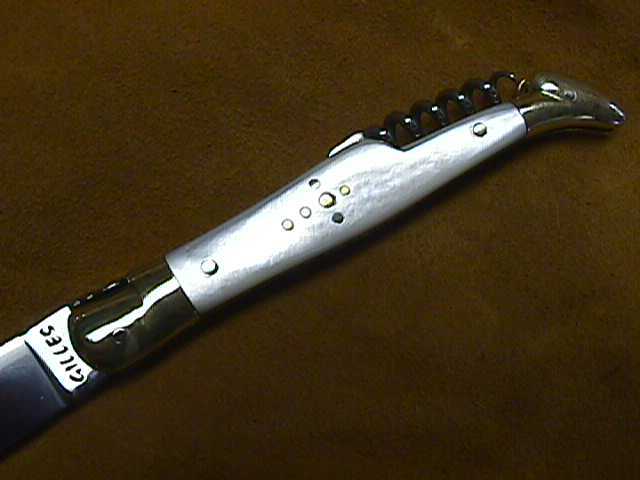 These parts are "Artisan" another quality Laguiole maker. 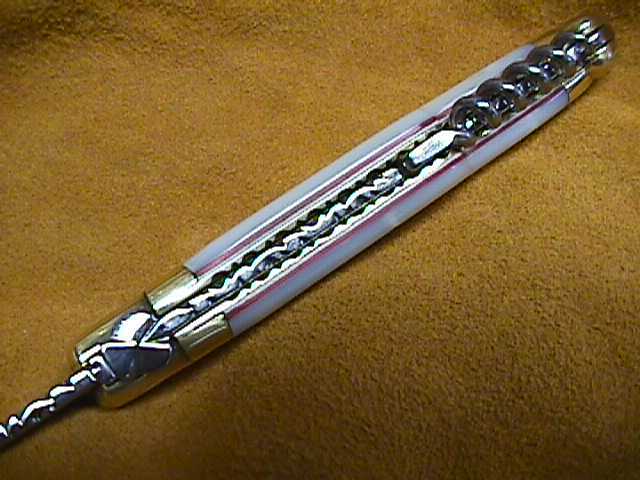 Here is the corkscrew model. You can cut your cheese and sausage plus pull the cork on your wine. The scales are mother of pearl, the knife is fileworked in it's entirety and has colored spacers to set off the MOP. 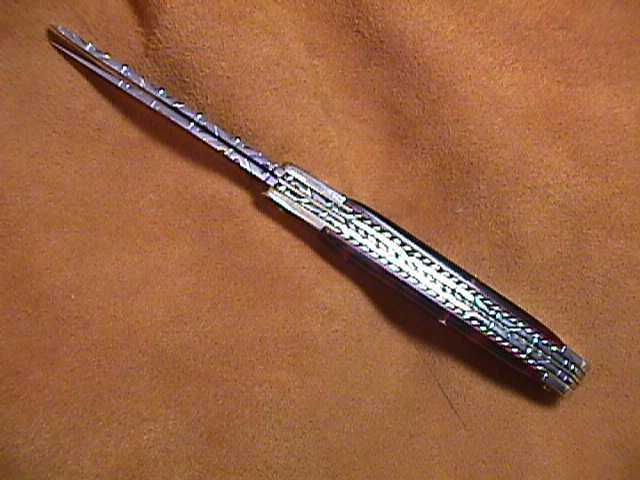 This is a small 2 blade trapper model. The parts are all american made. 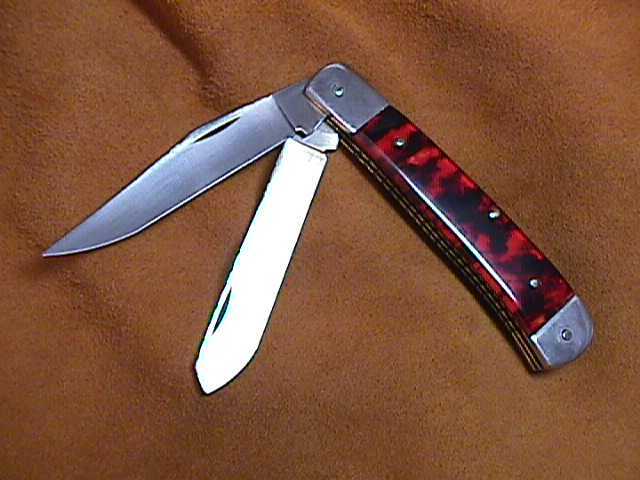 The knife is done in simulated tortoise shell with red spacers for effect, shows through the opaqueness. The entire knife is fileworked on both blades, spines and liners. The liners are brass and the bolsters are solid nickle silver. 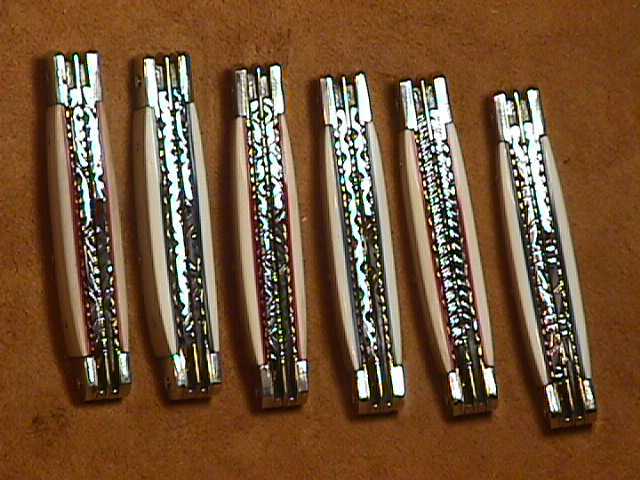 These are a fine workingmans pocket knife. 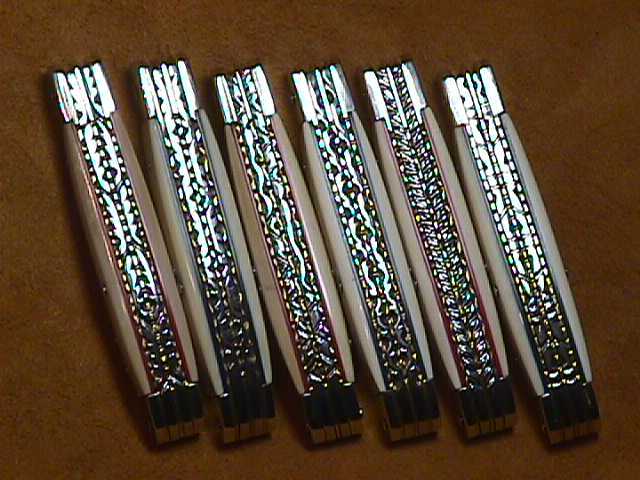 These are a set of 6 each, 2 bladed trappers. They are scaled in mastodon ivory, 10K-30K years old material. Each knife has a different file pattern. Blades and spines have the filepattern opposing. These were ordered by "Clarinet Cat" as gifts for his wedding party, best man on down. Yes, he got one too!